The past is the past whether years or just minutes ago. Past events leave prints in us. Sometimes we wear the prints like badges and interact with folk and situations according to that badge. Sometimes those prints are deep inside and we learn to ignore them. Or we cope with them (“you know this is just my personality”). And then there are prints we didn’t realize were still there….such distant memories – we thought purged, done and gone. My belief is what influences the decisions (my emotions, my will) of what I will do or say. And with each experience we feed our beliefs and thoughts creating a cycle of how we deal with life – the mundane, the routine, the challenges, the opportunities, the accomplishments and the miracles. Every moment of life brings potential triggers that recall (intentional or not) our prints, our previous experiences. It could be a smell, sound, sight, touch, taste, request, action or a combination of them. A life trigger sets off a land mine – one that is negative or positive, depends on the print. I have no recollection, but family members often retell of an extended family trip where I almost drowned. My aunt was the only person that could swim and she rescued me. My mother enrolled me in swimming lessons soon after but I went AWOL. THAT (refusing to participate) I remember. I never did pool parties or water parks. No way, no how. So invitations sparked a negative explosion. Sometimes I would respond negatively as if I was asked to renounce God. And other times my explosion would be internal pity, disgust or shame. I had passed on the fear to my children by my conniption outbursts when they got into more than ankle deep water. Negative, right? And then pit bulls (healthy, friendly ones) and fresh cut grass (the look or smell) create explosions for me as well. My father worked a lot. When he was home and it was daylight he would get involved with two of his three passions – his yard, his dogs and his cars. He kept THE BEST lawn. It is like thick, plush 5- 6 inches of new, organic carpet – no detail or corner neglected. When he finished manicuring, he would linger outside to admire. This is when I would come out to hang next to him in the fresh cut grass aroma. It was also the only time we were allowed to walk on the lawn so I took full advantage with bare toes. He also bred pit bulls. I would help and hang out for quality time. He would often mention to others how I was his helper. Triggers for these set off explosions of smiles, warm fuzzies and a desire to take a walk and talk. Sounds happy. And yet, sometimes when I get this happy I want to ‘extend’ the ‘feeling’. I overspend. I overcommit. I want to eat and drink without abandon. And then at the end of the month I wonder ‘What happened?’ when my account or schedule is negative or my clothes are too snug. I wish I had gotten into the car maintenance thing but it was too dirty and the music was too loud. So we want to grow into maturity and freedom. It is a heart, mind and behavior (body) engagement. We cannot control the first initial reaction we have to a trigger. It isn’t realistic. We cannot isolate ourselves to avoid or ignore them. It isn’t the trigger or the explosion we can control. The explosion can be those ‘feelings’: happy, sad or mad; get nauseous or a headache; tense up or have nerves go haywire; go cold or crave intimacy. 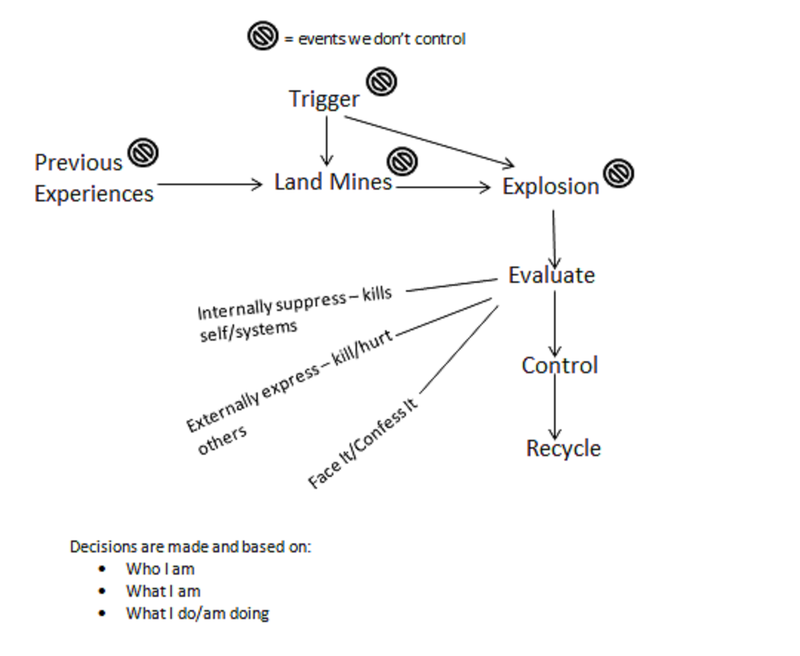 Our evaluation (what we can control) of the explosion focuses on the trigger and landmine and feeds our next step, the response. This response (also what we control) is whatever our habit, nature or learned response is – become legalistic or risky; go on the offense or defense; go along or reject; feel the pain or seek pleasure; flight or fight. Our attention needs to be on the present considering where we are today. This can stabilize the response – not having to cut my eyes, curse, yell, character defame and hit, accuse, take back/destroy, refuse to show up (mentally, emotionally or physically), make poor choices because of the reaction to the explosion. We CAN diffuse the explosive response based on the truth of God’s Word. Doing this avoids entrapment or dwelling on the failures. When we get entrapped, it seems as if our behavior is automatic. Sometimes we can explain the behavior with an excuse or reason. And then sometimes, we say in regard to why we said or did it, “I don’t know why I did” or “I wasn’t thinking”. Is that really true? Perhaps there was an unwillingness to think through and we justify our actions (or inaction) through fear or pride. What we believe comes from the heart where the spirit dwells. What we think comes from the mind where the soul dwells. What we do happens through the body, our physical being. Self-improvement plans are only engaging the mind and body and after some time the mind can’t reason to keep going and the body stops doing. It wasn’t in my heart – it won’t stick. My source of support and strength is not me, or others or other things. It is God. And through Him, others can be used as resources for support. So if I really want to be free, I have to focus on what God says today. I can know what He says by searching with my whole heart. THEN He can help me get my head together. THEN my behavior, my responses will fall accordingly. It isn’t a one hit wonder. We have to search, practice and do it over and over and over and over and over and over. Sometimes there may be a struggle or a miss, but remember that a second gone by becomes the past. To love God is to hate evil. God does not tolerate sin. •	So no human being can brag in God’s presence. •	I keep your word close, in my heart, so that I won’t sin against you. Our job with others is to introduce them to Christ. Jesus will work with them once they have accepted Christ in their hearts. •	People whose lives are based on selfishness think about selfish things, but people whose lives are based on the Spirit think about things that are related to the Spirit. 6 The attitude that comes from selfishness leads to death, but the attitude that comes from the Spirit leads to life and peace. 7 So the attitude that comes from selfishness is hostile to God. It doesn’t submit to God’s Law, because it can’t. 8 People who are self-centered aren’t able to please God. •	Brothers and sisters, if a person is caught doing something wrong, you who are spiritual should restore someone like this with a spirit of gentleness. Watch out for yourselves so you won’t be tempted too. •	But people who are unspiritual don’t accept the things from God’s Spirit. They are foolishness to them and can’t be understood, because they can only be comprehended in a spiritual way. •	All the ways of people are pure in their eyes, but the LORD tests the motives. •	He called his twelve disciples and gave them authority over unclean spirits to throw them out and to heal every disease and every sickness. •	Aren’t all the angels ministering spirits who are sent to serve those who are going to inherit salvation? •	Dear friends, don’t believe every spirit. Test the spirits to see if they are from God because many false prophets have gone into the world. •	We know this because God knew them in advance, and he decided in advance that they would be conformed to the image of his Son. That way his Son would be the first of many brothers and sisters.